I know I have read a great book when I feel sad as I finish it. 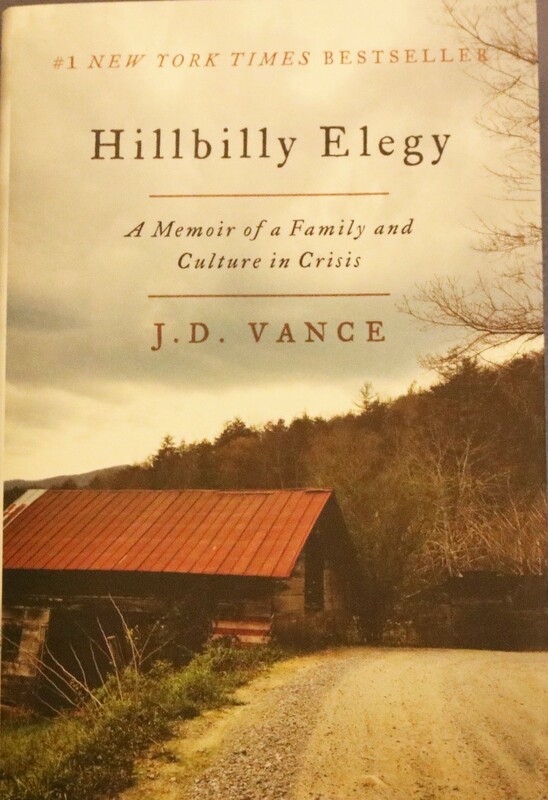 I finished Hillbilly Elegy: A Memoir of a Family and Culture in Crisis, by JD Vance and I wanted two hundred more pages. This is one of the most soulful books I have read in years. It chronicles the author’s life from early childhood in Kentucky to adolescence in the Appalachian region of Ohio to eventual graduation from Yale Law School. 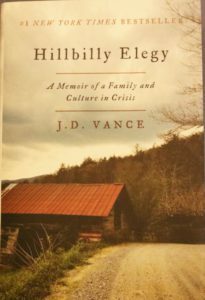 Vance not only details his family history but ties it to the decline in the culture of the rural areas and the rise of bitterness toward the ‘Elites.’ His own personal trauma is intricately interwoven with the current cultural trauma of our society. 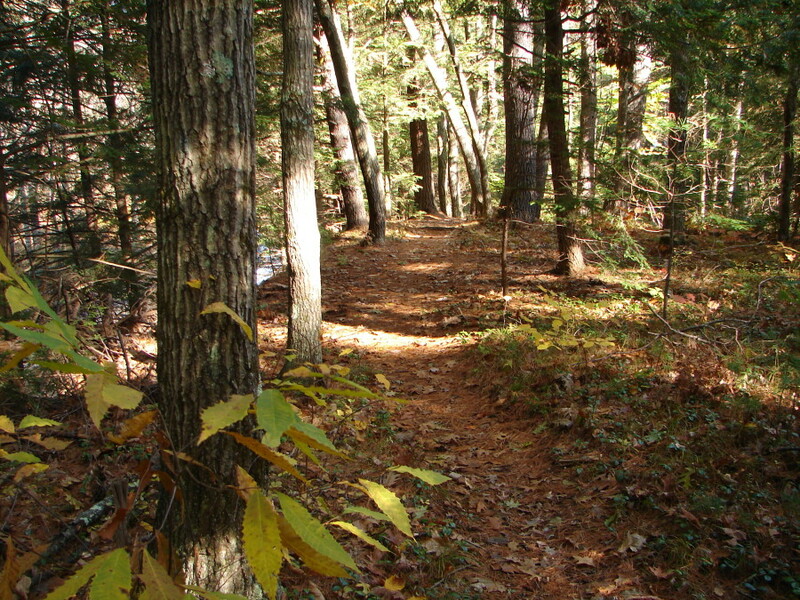 He describes his hillbilly family with its special life-style, rules, laws and rituals. The family and community are full of violence, rage and fury. His family is a textbook of dysfunction. Yet, he writes with deep compassion and empathy about each person. The core of this family is a deep and profound love that an outsider would simply not perceive. His grandmother, the matriarch of the family, was his most important advocate and protector. She is a fierce defender and person who essentially raised him. Part of the virtue of this book is that there are no enemies. He profoundly criticizes many government programs designed by people who had never met any of the individuals they were supposed to help. He does this without demonizing the programs or their staff. In an era where we are told that every government program and its staff is an enemy this is especially refreshing. There is deep searing pain in this family that is not glossed over and yet love persists. There is no bypassing the pain or excusing people responsible for it. Over the years he gradually emerges and begins to embody the unique particularity of his own Soul. His culture and family never are used as an excuse for himself or anyone else. And he is implicitly and explicitly critical of people who blame their problems on other people, institutions, governments or laws. Vance is no saint and in the later parts of the book he shares some of his vulnerabilities and flaws. Not surprisingly relationships are not easy. But he never stops growing and emerging. The book is worth reading as an example of soul embodiment occurring in the world without once using the terms spiritual growth or the soul. And yet soul radiates from every page. In addition, he offers a valuable though conservative leaning perspective on the present condition of our country and its politics. •	Over several decades the rural economy crashed. •	People lost hope in the American dream that hard work, education, and family values would lead to family economic advancement. But as the economic collapse deepened over decades hard work no longer seemed to lead to prosperity. •	People felt cheated. Their effort no longer mattered. Consequently many people became irresponsible, made poor decisions and developed drug addictions. •	This occurs as they see others getting special treatment; grants, affirmative action, welfare benefits and awards while they fell behind as individuals and families. •	Then, they as white people, are told they are a privileged group. Enormous resentment festered toward the benefit recipients and elites who hold power in this process. •	They surrender to the decline and sign up for as many benefits as they can find. •	If belief in hard work and upward mobility are fake it is an easy jump to the belief that the news is also fake. •	Add to this the thirty years of right wing media making every nonwhite, nonworking class group “other” and thus to blame for the problems and we find a culture collapsing around itself. From this mix emerges the rage we now experience around us. There are other influences involved in the process but this is a very good start for understanding what we are experiencing at the cultural and political level. I urge you to read this terrific book both as a soulful story and a very good explanation for our contemporary situation. Thank you, Dr. Campbell- my cousin and I each ordered this book. I’m glad you’ll read it. If you wish, please let me know what you think when you finish.